He starts with his own experiences with anti-depressants. Despite feeling like they were helping, it became clear he was just as badly off as before he tried them years ago: "No matter how high a dose I jacked up my antidepressants to, the sadness would always outrun it" (10). I had heard about the ineffectiveness of anti-depressants before, but it hadn't occurred to me that the same was true for anxiety meds, but "everything that causes an increase in depression also causes an increase in anxiety, and the other way around. They rise and fall together" (12). He give us an interesting history of the placebo and how it affects us, mind and body, starting with hucksters back in the 18th century. We all know that our belief in a substance can effect how well it works, but we haven't been told to what extent this is the case for depression and anxiety meds. "There was never any basis for it, ever. . . . It hasn't been discredited because it didn't ever get 'credited' . . . In the biggest study of serotonin's effects on humans, it found no direct relationship with depression. . . . attributing depression to low serotonin is 'deeply misleading and unscientific.' . . . The drugs work "because you believe you are being looked after and offered a solution" (29). Professor Joanna Moncrieff agrees, "'There's no evidence that there's a chemical imbalance' in depressed or anxious people's brains" (30). "The conversation shifted from figuring out what was making us so unhappy in our lives to trying to block the neurotransmitters in the brain that allow us to feel it" (53). But that story, that a simple daily pill will fix everything, is very appealing. "It was like a leash I had put on my distress to keep it under some control" (11). And Hari warns about how unnerving it can be to start to recognize the misinformation around this story. Even with modest effects in some people, a typical researcher in support of the drugs "makes the case for prescribing antidepressants for six to twenty weeks" (36) despite the fact that many people are on them for years. The majority of users try more than one type of medication and more than one dosage in an effort to make the drugs work. "Within a year, half of the patients were fully depressed again. . . . This evidence has been followed up several times since--and the proportion of people on antidepressants who continue to be depressed is found to be between 65 and 80 percent. . . . most people on these drugs, after an initial kick, remain depressed or anxious. . . . Chemical antidepressants may well be a partial solution for a minority of depressed and anxious people. . . . for the vast majority we clearly needed to find a different story about what is making us feel this way, and a different set of solutions" (37). The ineffectiveness is worse when we consider the number of very real side effects of the drugs including a negative effect on the liver and heart, but also sexual dysfunction, which can exacerbate depression and anxiety. In the DSM, the dominant model for depression and anxiety has been through a checklist. You'd think that, if it's the case that serotonin levels is the culprit, then doctors would measure and monitor levels and watch the effects the drugs are having, like they measure cholesterol levels and blood pressure. But instead, they tick boxes on a list. At one point in the history of the DSM, it was noted that grief and depression are too similar, so an exclusion was added indicating the list might not indicate depression in a particular patient if it's been within a year following the death of a loved one, then it shifted to two weeks, and now grief is no longer contraindicated. Grief became depression as if it's an illness to be affected by the world. But, Hari asks, "What if depression is, in fact, a form of grief--for our own lives not being as they should?" (44). "It wasn't just a problem caused by the brain going wrong. It was caused by life going wrong" (53). The medical community generally accepts that there are different types of depression and some are caused by the world: there's endogenous depression (chemical imbalance) and reactive depression. But this wasn't actually investigated until George Brown conducted studies looking at the difficulties and stabilizers in the lives of people reporting depression or anxiety. He found that 68% of people who develop depression had "experienced a significant negative experience in the year before the depression set in . . . [were] more likely to be facing serious long-term stressors . . . [and that] positive stabilizing things in your life . . . massively reduced the chances of developing depression" (50). Having both negative experiences and stressors together increased the chance of depression dramatically. Together, George Brown and Tirril Harris determined that "paying attention to a person's environment may turn out to be at least as effective as physical treatment" (54). "The social and psychological causes have been ignored for a long time, even though it seems the biological causes don't even kick in without them . . . the presence or absence of mental health is above all a social indicator and therefore requires social, as well as individual, solutions" (256). "The United Nations--in its official statement for World Health Day in 2017--explained that 'the dominant biomedical narrative of depression' is based on 'biased and selective use of research outcomes' that 'cause more harm than good, undermine the right to health, and must be abandoned.' . . . We need to move from 'focusing on 'chemical imbalances' to focusing on 'power imbalances.' . . . You aren't a machine with broken parts. You are an animal whose needs are not being met. . . . your distress is not a malfunction. It is a signal--a necessary signal" (256). But, if it's not just an accident in the brain, then will people experiencing these problems begin to feel that it's because they've done something wrong or haven't the strength necessary to cope the way healthier people do? In fact, studies suggest it's the opposite. Calling it a disease doesn't reduce stigma surrounding it: AIDS and leprosy are diseases, but there was still stigma around them (152). With a belief in a unbalanced chemicals, "You leave the person disempowered, feeling they're not good enough--because their brain's not good enough. . . . it pitches us against parts of ourselves" (154). The belief that depression and anxiety are caused by brain chemistry makes people distance themselves from themselves. If we can't trust our own brain, our own thoughts and feelings, then what can we trust? "you were more likely to hurt somebody if you believed their mental illness was the result of their biochemistry than if you believed it was the result of what had happened to them in life. Believing depression was a disease didn't reduce hostility. In fact, it increased it. . . . If it's a response to how we live, you can get something richer: empathy--because it could happen to any of us. It's not some alien thing. It's a universal human source of vulnerability . . . looking at it this way makes people less cruel, to themselves and to other people" (153). Hari has Krishnamurti remind us: "It is no measure of health to be well-adjusted to a sick society" (155). Hari divides his book into nine causes of depression/anxiety and seven solutions, but I fit the causes and solutions together into six big factors affecting this tragedy in so many of our lives. In a nutshell, we need to reconnect with each other, listen to people's suffering and be heard ourselves, be able to have an effect in the world, recognize what's actually important in life, have hope and a measure of control over the future, and go outside. And there's a surprising amount of leftist politics in the mix that's distilled from the research! As most of us are acutely aware, loneliness has no correlation with the frequency of our contact with other people. Rather it's "the sense that you're not sharing anything that matters with anyone else. . . . [You need] "to feel you are sharing something with the other person, or the group, that is meaningful to both of you" (83). Connection is about sharing ideas, and it doesn't work in a one-sided relationship. Researcher John Cacioppo looked at how loneliness affects our brain by measuring the cortisol levels of participants over time, and, "Becoming acutely lonely, the experiment found, was as stressful as experiencing a physical attack" (74). He also found that "lonely people are also anxious, have low self-esteem, are pessimistic, and are afraid other people will dislike them" (75). David Spiegel had a group of people remember time they felt really lonely and a different group remember a time they felt really connected to document any change, and deduced that "in most cases, loneliness preceded depressive symptoms . . . the effect was really big" (77). Hari looks at human nature in an evolutionary light from time to time, and suggests we exist because we can cooperate, but he curiously didn't discuss this study showing how much better human children are at collaborating than chimpanzees. It's what differentiates us from other primates, largely because of our complex language skills. From this perspective of people as just another animal group, we've disbanded our tribe. "We do things together less than any humans who came before us" (80). We're no longer actively involved in communities like we once were, and when people were asked the number of confidants they have, the most common answer was none (79). This is a marked change from just a few decades ago. "We haven't just started doing things alone more . . . We have started to believe that doing things alone is the natural state of human beings" (83). Loneliness is a signal for us to go back to the group any way we can. Another study looked at the number of micro-awakenings people have at night, which is strongly correlated with anxiety. People who live within a well connected group have significantly fewer micro-awakenings at night. It's as if they don't feel the need to be as aware of their environment because they know they've got backing. "Lonely people are scanning for threats because they unconsciously know that nobody is looking out for them" (82). Once in the throes of loneliness, people need more reassurance than previously, but "many depressed and anxious people receive less love, as they become harder to be around" (82). It's a vicious cycle as, "Your brain alters according to how you use it . . . Being lonely will change your brain" (84). "Neuroplasticity is the tendency for the brain to continue to restructure itself based on experience. . . . Your brain is constantly changing to meet your needs. It does this mainly in two ways: by pruning the synapses you don't use, and by growing the synapses you do use. . . . The brain changes as you become depressed and anxious. . . . being lonely, or isolated, or grossly materialistic--these things change your brain, too. And, crucially, reconnection can change it back. . . . Because you are feeling intense pain for a long period, your brain will assume this is the state in which you are going to have to survive from now on--so it might start to shed the synapses that relate to the things that give you joy and pleasure, and strengthen the synapses that relate to fear and despair" (144-46). His solution is all Chomsky's call for solidarity over competition. We need to shift from an individualistic to a collectivist vision. "When people rediscover each other, problems that previously seemed insoluble start to look soluble" (179). If we've been stuck like this for a while, it can be a matter of "fake it 'til you make it" as we help ourselves believe our neighbours aren't the enemy. Depression and anxiety are about 30% genetically determined, but even with the genetic markers, we're more likely to experience depressed or anxiety after a trigger, a "terribly stressful event, or a great deal of childhood trauma" (148). Researchers noticed that people who struggled with obesity were more likely to have had a traumatic childhood. Vincent Felitti's Adverse Childhood Experiences Study found that "for every category of traumatic experience you went through as a kid, you were radically more likely to become depressed as an adult. . . . Curiously, it turned out emotional abuse was more likely to cause depression than any other kind of trauma--even sexual molestation. Being treated cruelly by your parents was the biggest driver of depression" (111-112). This is a hard chapter to read as a mum of someone suffering from anxiety. And, while I couldn't be convinced that I'm cruel, I couldn't help scrutinizing all those moments when my temper got the better of me in front of my little ones, and my apologies don't always soothe as much as hoped. "When you are a child and you experience something really traumatic, you almost always think it is your fault. . . . it is, in fact, a solution to a problem most people can't see. . . . You can admit to yourself that you are powerless. . . . Or you can tell yourself it's your fault. If you do that, you actually gain some power--at least in your own mind. . . . blaming yourself for your childhood traumas protects you from seeing how vulnerable you were and are. . . . But that comes at a cost. If you were responsible for being hurt, then at some level, you have to think you deserved it" (113-114). This bit is Freudian, and now we're in the room with Robin Williams saying "It's not your fault. It's not your fault." over and over like a broken record until it starts to sink in. "an opportunity to describe the traumatic experience--to craft a story about it, so the patient could make sense of it. . . . The second--just as crucial--was to show them that they wouldn't be judged. . . for them to see that an authority figure, who they trusted, would offer them real compassion for what they'd gone through. . . . the patients who had their trauma compassionately acknowledged by an authority figure . . . were 35 percent less likely to return for medical help for any condition" (242). We need to help people stop feeling shame for what has happened to them to help end their perception of humiliation. It's basic psychoanalysis, but it's also the Catholic confessional. I've been significantly affected by St. Augustine's notion of original sin. Some people see it negatively, as a branding of 'sinner' on us all by an authority because we're bad. But it has a different flavour in my mind: It suggests that we're all necessarily fallible, so there's nothing we can do about it but try again tomorrow. We should always just accept our shortcomings and mistakes without shame because of course we're going to have them. But nothing helps let go of guilt like confession. We need to have people we can talk to about what's been done to us and what we've done if we ever hope to get past it all. Forgiving ourselves is just as important as forgiving others. In 2006, I went to a First Nation sweat lodge ceremony and found yet another version of a confessional there. I was the only visitor and the only woman, and the group of us sat near naked, with our knees touching each other's in a circle, with hot rocks in the centre of a pitch black, fur-covered dome. Water on the rocks filled the place with steam, and I had to dig my fingers into the ground to keep my bearings. Sensory deprivation can be unnerving. A small drum was passed from person to person as each told the pile of rocks what's been done to them and what they've each done. The darkness made it all anonymous, and the comments were met with compassion. The ritual ended with a line up of hugs and a feast. Somehow, people have to feel heard. Part of our problem is that we think we're above this need for release now. We have been on a quest for perfection to the extent that we can't admit to one another that we're anything less, and that's destroying us. "This evidence suggests that by reconnecting a person with his childhood trauma, and showing him that an outside observer doesn't see it as shameful, you go a significant way toward helping to set him free from some of its negative effects" (243). Hari writes at length about our need for meaningful work, but also recognizes that's not possible for many of us. But we do need meaningful something. I had a friend who drove a garbage truck, who regularly took some of the junk he found and made art with it. We can have dead-end jobs, yet still have an effect on the world. As Hari relates, only 13% of people actually find their job engaging; 24% outright despise their jobs, and the rest are just putting in their time, so let's hope we can find time to do more than just survive our lives. “No other technique for the conduct of life binds the individual so firmly to reality as an emphasis on work, which at least gives him a secure place in one area of reality: the human community…. [but] the great majority work only because they have to, and this aversion to work is the source of the most difficult social problems” (22). This is a problem Hari doesn't address, that it's possible that some people don't have a desire to create or to produce in a way that is self-satisfying. It seems that the people Freud saw, with an aversion to anything but being entertained, people who, today, are immersed in watching shows or playing games of one description or another, are either seen as blissfully ignorant or so affected with malaise that they can't escape their own quest for constant mindless pleasures. But I digress. Hari discusses studies that show a linear correlation between depression and status. People with lower status in a field of work are more likely to be depressed and four times more likely to have a heart attack than the boss (67). Michael Marmot found that, "Disempowerment is at the heart of poor health" (69). We feel worse the less control we have over our own lives, the less we can change our situation, and the less we can execute our own ideas at work. As I read this, I thought of all the little ways people take back a measure of control from the bottom, often by slightly sabotaging the company or their boss by doing a mediocre job or overtly ignoring the rules. Being a cog in the machine, or being alienated from the means of production, affects our sense of self worth. We need to feel in control of our lives again, to feel empowered. "It's not the work itself that makes you sick. . . . It's the feeling of being controlled--of being a meaningless cog in a system. t's the feeling that no matter how hard you work, you'll be treated just the same and nobody will notice--an imbalance between efforts and rewards. And it's the feeling of being low on the hierarchy" (207). In another study, blood samples of baboons found that, "the lower you are in the hierarchy, the more stressed you are. . . . depression is, for humans, in part a submission response --the evolutionary equivalent of . . . saying, no more. Please, leave me alone. You don't have to fight me. I'm no threat to you" (119-20). It's not just a matter of hierarchies, though, but the level of inequality that affects us. "Highly unequal societies . . . find higher levels of mental distress. . . . Today, we are living with status gaps that are bigger than any in human history" (121). Hari suggests, "We can find practical ways to dismantle hierarchies and create a more equal place, where everybody feels they have a measure of respect and status" (122), and offers several examples of people who have joined together to work with a democratic model of business rather than the top-down authoritarian and hierarchical model we've accepted as the norm. "A major study by scientists at Cornell University investigated 320 small business. . . . the businesses closer to the democratic model grew, on average four times more than the others" (209). When people are happier at work, they work more for the benefit of the whole. The solutions to this suggested by Robert Reich's Inequality for All (labour unions, shopping locally, invest in education, regulate corporations...) won't just restart the economy; they'll decrease these forms of mental illness. Now we get into philosophy. In class I harp on the fact that so many philosophers, for thousands of years, insisted that the good life isn't about adding to our pleasures but about tempering our desires. Over and over this same answer has been deduced century after century, so surely they must be on to something, amiright?! But it often falls on deaf ears. Now I have science to back me. Hari laments our "junk values" as it's clear that "materialistic people, who think happiness comes from accumulating stuff and a superior status, had a much higher levels of depression and anxiety" (94). He differentiates between intrinsic values (things that give us joy and flow in and of themselves) and extrinsic values (getting things or acting to impress others). Plato might categorized them as the values that are from reason rather than our spirit or appetites. Tim Kasser's studies found that, "People who achieved their extrinsic goals didn't experience any increase in day-to-day happiness--none. . . . people who achieved their intrinsic goals did become significantly happier, and less depressed and anxious" (96). Much of the discussion on flow is Jungian acknowledgement of the importance of play in our lives. And much of the rest is as the Stoics said: once we recognize what we can control and what's beyond our control, we can be happiest if we just try to affect what's within our own control. What's in our control is our attitude and character (prudence, fortitude, temperance, justice). What's not in our control are preferred indifferents (acquisitions, reputation, talents) and dispreferred indifferents (sickness and death). We can try to influence things we are better off being indifferent to by taking care of our health so we're less likely to get sick, but we shouldn't get attached to the outcome, because, at some point, getting sick will be beyond our control. And if you ever feel badly about your own station, there's always someone lower you can look to in order to remind yourself how well off you really are. But Hari doesn't mention the Stoics. Hari shows that junk values for materialism and popularity poison relationships and connections, which are vital for our mental health. "You can have everything a person could possibly need by the standards of our culture--but those standards can badly misjudge what a human actually needs in order to have a good or even a tolerable life" (151). He advocates fixing this two ways. The first solution is defensive: he sees advertising as the enemy, filling our lives with "mental pollution." We are more affected by ads than we care to admit, and we need to "Restrict or ban mental pollution, just like we restrict or ban physical pollution" (211). This actually happened in Sao Paulo, Brazil with their Clean City Law, so it's possible. The second solution is proactive, to try to draw out positive values in people. Nathan Dungan asked people two questions: "What do you spend your money on?" and "What do you really value?" He found that we've all experienced "finally getting the thing we want... and feeling oddly deflated, only to find that before long, the craving cycle starts again" (215). Then he asked them to list their intrinsic values and how they would live differently if they acted on these other values (like helping their neighbours and working together to fix up the local park), and he found, "It was possible to intervene in people's lives in a way that would significantly reduce their levels of materialism" (217). A problem with materialism is that it sets us up against each other, always comparing and competing. I couldn't help hearing my mum's mantra to me: never compare and never compete if you ever want to be happy. It's easier said than done, but it does have an effect to have it chanted at you during your formative years! "We are trained to think that life is a fight for scarce resources--'even if it's for something like intelligence, when there's no limit to how much human intelligence can grow across the world' Of you become smarter, it doesn't make me less smart--but we are primed to feel that it does" (219). "It turned out that depressed people were significantly more likely to recover from depression if they went into an eight-week meditation training program than people in a control group who didn't. . . . Other studies have found that meditation is similarly helpful for people with anxiety. . . . It's as though the loving-kindness meditation works a muscle that helps us resist and counteract the worst of our culture" (222-23). This type of meditation develops an agapic love for one another as it weeds out negative comparisons. "Sympathetic joy is a method for cultivating 'the opposite of jealousy or envy...It's simply feeling happy for other people'" (220). This specific kind of meditation is a series that has people start by imagining feeling joy for themselves, for someone they love, for someone they don't really know, for someone they don't really like, and then for someone they hate or envy. "If you want to look at other people and be happy for them, you can be happy every single day, regardless of what's happening to you" (222). The idea is that meditation can break an addiction to ourselves and help us see pat the boundaries of our individual being. It can give us "a perceptual shift, where you recognize you're not enslaved to your thoughts or your emotions or your feelings--that you actually have moment-to-moment choice, and there's a joy in that" (236). 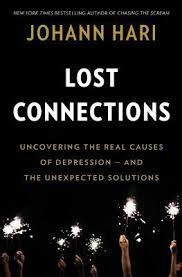 "Depression is a kind of constricted consciousness. . . . You could say people have forgotten who they are, what they're capable of, have gotten stuck...Many depressed people can only see their pains, and their hurts, and their resentments, and their failures" (237). Meditation and rethinking our values can help get us unstuck. "When it came to these questions about what they or anyone else would be in the future, they would look puzzled. . . . they couldn't see who they, as individuals, would be in the future. . . . If you live in a First Nations community with no control over its own destiny, it's hard to construct a picture of a hopeful or stable future in your mind. You're at the mercy of alien forces that have destroyed your people many times before" (137). This idea is repeated throughout the book: having a sense of control over your own life is necessary to ward off depression and anxiety. "survival in Nazi concentration camps 'depended on one's ability to arrange to preserve some areas of independent action, to keep control of some important aspects of one's life despite an environment that seemed overwhelming.' Later studies showed that a prior sense of helplessness and lack of control is linked to both stress and the onset of disease. In one study wild rats were suddenly deprived of all control over their environment. They soon stopped struggling to survive and died. In another study, in a group of subjects who were told they were going to take a battery of important tests, even the pointless power to control the order of those tests was found to reduce anxiety levels." "There was a window when people on middle-class and working-class incomes had some sense of security and could plan for the future. That window has been closing, as a direct result of political decisions to free businesses from regulation and to make it very hard for workers to organize to protect their rights, and what we are losing is a predictable sense of the future. . . . this sense of precariousness started with people in the lowest-paying jobs. But ever since, it has been rising further and further up the chain" (141). If we want to help restore the future, we have to make it easier for people to just exist. "If you're going to try to reconnect . . . you will need time, and you need confidence. . . . It's hard to join a big struggle when it feels like a struggle to make it to the end of the day" (245). "It is a well-established fact that the poorer you are, the more likely you are to become depressed or anxious. . . if you have an income below $20,000, you are more than twice as likely to become depressed as somebody who makes $70,000 or more" (247). There's a "direct relationship between poverty and the number of mood-altering drugs that people take--the antidepressants they take just to get through the day" (247). The solution? Guaranteed basic income. "Students stayed at school longer, and performed better there. The number of low-birth-weight babies declined, as more women delayed having children until they were ready. Parents with newborn babies stayed at home longer to care for them, and didn't hurry back to work. Overall work hours fell modestly, as people spent more time with their kids, or learning. . . . Depression and anxiety in the community fell significantly" (248). "It makes you less of a hostage to the job you have . . . which we would expect to reduce the depression caused by extreme status differences. . . . Not many people are thinking about what's actually happened to our labor market, and our society, that these forms of despair are popping up everywhere. . . . For the first time, they will be able to leave jobs that are degrading, or humiliating, or excruciating. Obviously, some boring things will still have to be done. That means those employers will have to offer either better wages, or better working conditions. In one swoop, the worst jobs, the ones that cause the most depression and anxiety, will have to radically improve, to attract workers" (249-51). Finally, Isabel Behncke explains "how being cut off from the natural world can cause depression" (123). In zoos, bonobos lowest on the pecking order get full-blown depression that's not seen in nature. In a study tracking movement of people, "What they found was clear: the people who moved to green areas saw a big reduction in depression, and the people who moved away from green areas saw a big increase in depression" (126). "They got people who lived in cities to take a walk in nature, and then tested their mood and concentration. Everyone, predictably, felt better and was able to concentrate more--but the effect was dramatically bigger for people who had been depressed" (127). Even running outside has been shown to have a greater effect on depression and anxiety than running on a treadmill. Similar to the discussion of meditation, Hari wasn't about this either, but, "Becoming depressed or anxious is a process of becoming a prisoner of your ego . . . a common reaction to being out in the natural world is the precise opposite of this sensation--a feeling of awe. . . . And this helps you see the deeper and wider ways in which you are connected to everything around you" (129). Hari explains it as an evolutionary need to see landscapes that we once lived in, but I tend to see it as being in a natural environment uses our senses in a way not found indoors. What we see and hear and smell is more noticeable than in sterile offices. That can help us get out of our heads as we are provoked into awareness of what's beyond ourselves. As the Guardian review suggests, "Hari is by no means the first writer to call for a compassionate, common-sense approach to depression and anxiety, or to point out how medical and societal attitudes have fallen short. But his book brings with it an urgency and rigour that will, with luck, encourage the authorities to sit up and take note." So, while meds might work for some, it can certainly also help to focus on social connections, find people to share with as much as possible and tell your story to, find purposeful activity, recognize the importance of intrinsic values over materialistic ideas (and avoid advertising), find ways to at least develop an illusion of control over your environment, and go for a walk in the park!